Even back when I was a “limited statist,” desperately trying to increase freedom through voting and petitioning and campaigning, deep down inside I already knew that political activism was totally pointless and hopeless–that it would never lead to freedom–but I kept trying anyway, because I just didn’t know what else to do, and I refused to give up. 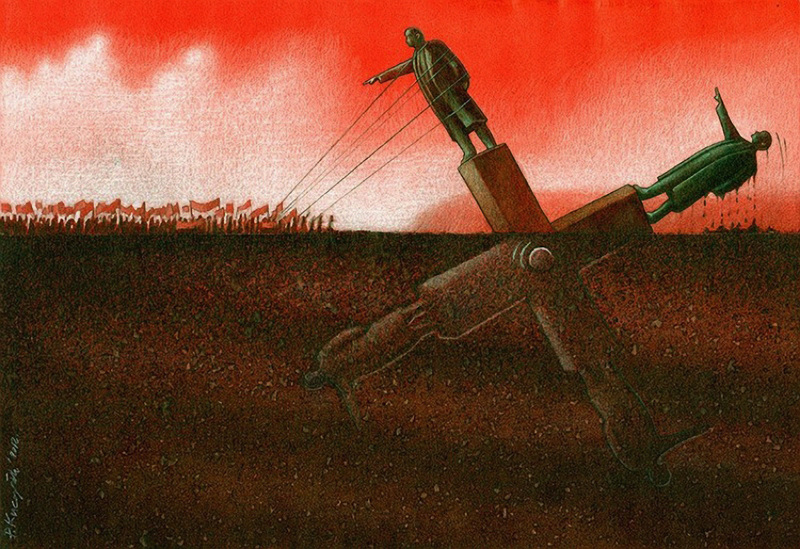 As depicted in the above image, politicians come and go, presidents come and go, entire governments come and go, but fundamentally the system stays exactly the same and there’s no change in its purpose, which is the exploitation of the individual. This is the case today, and has been the case throughout all of history. I have “good” news and bad news for all politicians. The bad news is that you will continue to fail, even if you get thousands of years to try again and again. The “good” news is that it’s not entirely your fault. You’re trying to change a social system that was designed to make you fail. The game is rigged. The “rules of the game” are such that it’s certain from the very beginning that you will fail. You will never be able to win as long as you continue to participate in this system according to the rules that it imposes on you. In other words, you will never be able to bring sustainable development for everyone within this system, simply because that’s not the goal of this system. There are people who decide to get involved in politics for noble reasons. And they may even have a high degree of integrity. But most of the time these people are just too naïve to understand what they’re getting involved in. They don’t understand how this system works at the deeper levels. And when they eventually get into positions of power in the system, they start to find out that changing things is not as easy as they thought. In fact, they soon find out that it’s quite impossible. And this is not only the case in the USA, but all around the world, because the same anti-social system of enslavement is currently implemented worldwide. It’s a system that Hitler and Qaddafi fought against, trying from the inside and achieving some short-term successes in the beginning, but eventually failing. if they’re weak they bend to the will of the system and slowly but surely become just as corrupt, to the point of waking up one day months or years in the future, finding out that they’ve become what they initially set out to fight against. On larger plantations an overseer represented the planter in matters of daily management. […] he had the difficult and often despised task of middleman and the often contradictory goals of fostering both productivity and the enslaved work-force. Back in those days it was blatantly obvious to all the other slaves that the overseers were sell-outs looking after the master’s interests. But this is not so easy for them to realize today, because today most of the slaves in countries around the world mistakenly believe that they’re “free and independent” and that slavery has been “abolished” many years ago. This brainwash has been forced into their heads from early childhood during their “education.” Moreover, the political process introduced by the masters (who mostly remain behind the scenes) has deceived the slaves into believing that they can be in charge of their own destinies on the plantation by “participating” and “choosing” overseers from amongst themselves. Today most of these chosen slaves who manage to become overseers usually wake up to the reality of what they are after they get into government and start receiving orders from the owners of the plantation. And the owners of the plantations worldwide are the international financial elite. Yes, the same ones Hitler often referred to and fought against. Through their emissaries — the “people in dark suits” as Vladimir Putin referred to them, or the “economic hitmen” as John Perkins called them in his book “Confessions of an Economic Hitman” — they tell the overseers in government how to run the plantation. This is usually done through their working arms, such as the International Monetary Fund (IMF), World Bank and Bank for International Settlements (BIS). If the overseers in government fail to take orders and implement the wishes of the owners of their plantation, the owners then proceed to apply increasingly more pressure on them to do so. First they try to bribe the overseers into doing what they want. If that doesn’t help, they move on to personal attacks in order to coerce them into doing what they’re told, or to force them to step down so that other slaves can step up who might be more willing to be puppets. If that doesn’t work, economic sanctions follow, assassination attempts, coup d’etats, and ultimately war. And as we’ve seen throughout history, the owners of the plantations always get their way, even if it takes a few years. This is because they keep controlling the system at the most fundamental levels, an important part of which is the monetary system and through the brainwashed minds of the slaves. As long as most of the slaves believe that they should be slaves and submit themselves to an outside and perceived higher authority — such as a government — they will always be easy prey. And as long as most of the slaves don’t understand the fundamental workings of this anti-social system, and how it’s being controlled at a deep level by the monetary system, they won’t understand how easily they can be influenced and controlled by it. When engineered economic crises begin manifesting themselves, the slaves will put the blame on the leaders in government, when in fact it’s the financial elite — the owners of the plantation — who’re causing most of it from behind the scenes in order to impose their will on everyone. So it’s obvious that if we want to achieve long-term positive results in getting rid of this system of enslavement, the only solution that will help is waking up most of the slaves so that they can see and deeply understand the reality that they’re living in today. And this takes time and requires a lot of patience and diligent work — work that includes most importantly self-education and research, and the sharing of knowledge with everyone about how this system works and what its true purpose is. It also means making sacrifices because sharing the truth with people — telling it like it is — will often not make you a popular or likable person. And if you’re going to walk the talk, it also means that you’re going to have to say “no” to many opportunities and conveniences in life. In the last few years I’ve had the chance to personally experience some of that. For example, in 2017, I said “no” to at least 3 opportunities from governmental institutions that came my way, after I had decided to never work for any government ever again. This during an economic crisis where anyone else would welcome such opportunities. And there have been many other instances where I decided not to help and not to participate, in order not to contribute to, or legitimize, the system, and not to reinforce people’s erroneous beliefs about it. Not a day goes by where I don’t think of how I can further limit my contributions to the system and become more independent. Like Larken Rose mentioned, the only way we can get rid of this system is when most people remove their cooperation from it. Instead, that cooperation should be put into developing alternatives. The more people do this, the sooner the current anti-social system of enslavement will cease to exist. The suspicion of many voters has now also been scientifically proven: election promises evaporate like snow in the sun during coalition talks. Economist Wimar Bolhuis writes this in his doctoral research. The conclusions leave nothing to be desired: from the big promises made to the citizen, little remains after voting. When a number of parties sit around the table to forge a coalition agreement, other interests suddenly get a more prominent role – that of the corporations, for example. The question is: does Bolhuis mainly show that some parties can simply negotiate much better than others? No, he says, it is not the case that every time a single party managed to pull all agreements to itself. All coalition parties promised more tax relief during election time than they recorded in a coalition agreement during formation time. In other words: from the sum of the political parts something entirely new is created that does not correspond to the average of the programs, nor to any one of the separate programs. In other words, once the politicians get elected, they get to hear from the slave masters behind the scenes what is required of them, and they have little choice but to go along. This automatically means that many, if not all, of the promises they made during elections cannot be fulfilled; the interests of the masters have priority over that of the slaves. This entry was published on Saturday, March 17th, 2018 at 9:14 pm by Karel Donk and is filed under General Personal Politics Takes on Life freedom statism. You can use the permanent link to bookmark and/or share it. Nietzsche was right , Rose became one the monsters years ago, on the same payroll as the Ottman’s no doubt. repeatedly dashed against the rock, all I see are tired roles being played by new faces repeating a cardboard cutout rhetoric. Don’t have them, if you do, don’t share them. The consensus and high ground have become corals for the slaughter of novelty and personality. These days burn out seems to be a plague among those awakening from their active hypnosis directly into psychosis. They “need” us! if we as a species had our lemming day ,(i.e 4 billion voluntarily off a cliff just because the incentive to tolerate perpetual suffering has been reduced to free (though somewhat dirty) air, with everything thing else commodified out of reach of the layman) we may see a change, until then, it will be to the beat of an indifferent drum that passion is exhausted for “They” are our owners. How did Rose become one of the monsters?